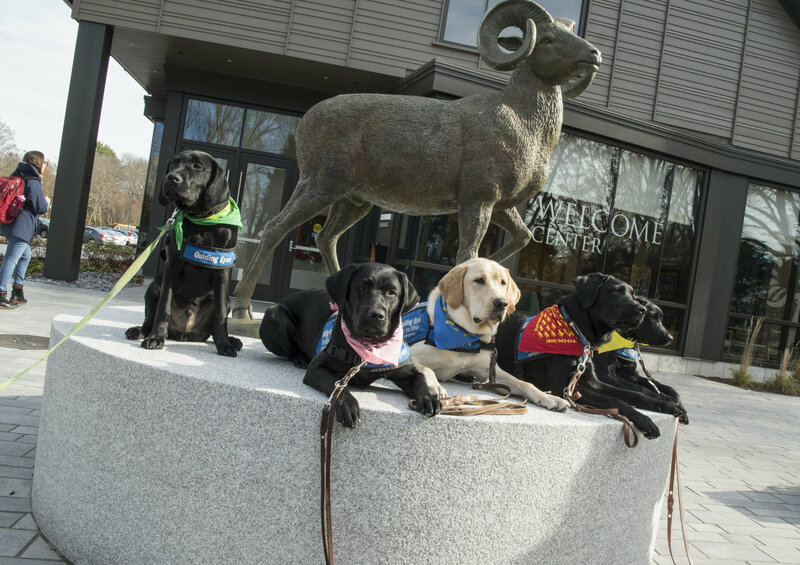 Meet Moses, Angus, Sadie, Levi and Etta, five of the friskiest members of the URI community. 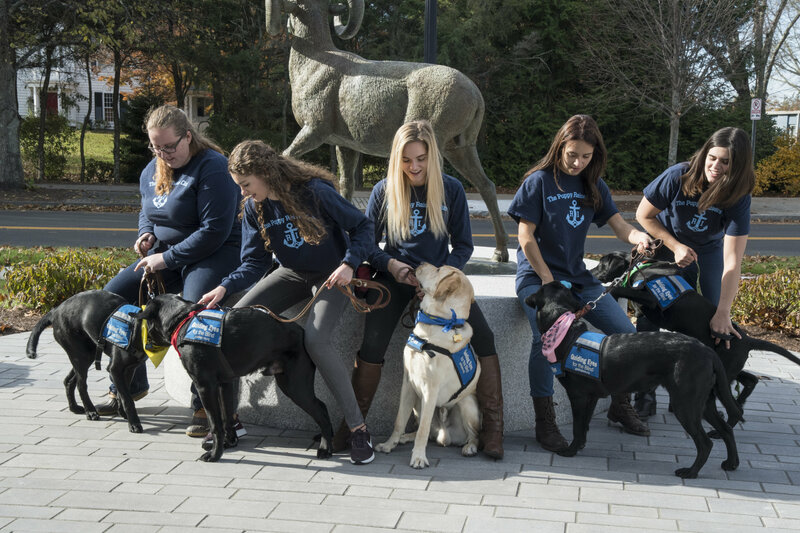 They are the actual puppies in the URI Puppy Raisers Club, a student organization that raises Labrador retrievers to be trained as guide dogs for the New York-based nonprofit, Guiding Eyes for the Blind. At a recent meeting, four pups aged four to seven months were lying at the feet of their student raisers, enjoying themselves. One chewed a toy, another whined, and the other two thumped their tails as new people approached. Later, puppies rotated through specific skill stations, such as keeping a loose leash as they walked by a peanut butter-laden plate. Angus showed great maturity as he strode by, ignoring temptation and receiving a hearty “good boy” and a treat. But despite the warm fuzzies, raising puppies to become guide dogs for the visually impaired is serious business. “It’s 24/7 if you’re raising a puppy because you have the dog with you all the time,” says club president Becky Provensal, a senior animal and veterinary sciences major. Provensal is now raising Levi, a seven-month-old yellow Lab, and her third dog. She joined the club as a freshman and progressed through the club’s rigorous demands for selection as a puppy raiser. “You don’t get a dog at the first meeting,” she says, dispelling a notion that sometimes disappoints new members. The student-led club works with Guiding Eyes for the Blind to raise guide dogs for the visually impaired. 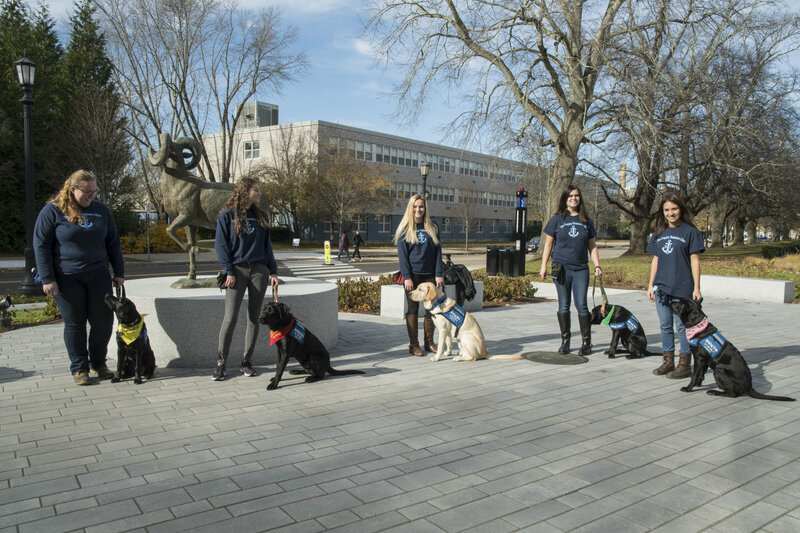 URI’s club has raised 13 dogs since two students founded the group in 2014 and is currently raising five puppies. Members now number about 60, of which only two are men. Just a few members raise puppies at any given time. The rest are certified dog sitters or help with club operations and fundraising. Guiding Eyes turns over the puppies to their raisers at eight weeks old, typically in late spring so the students can house-train the dogs over the summer. 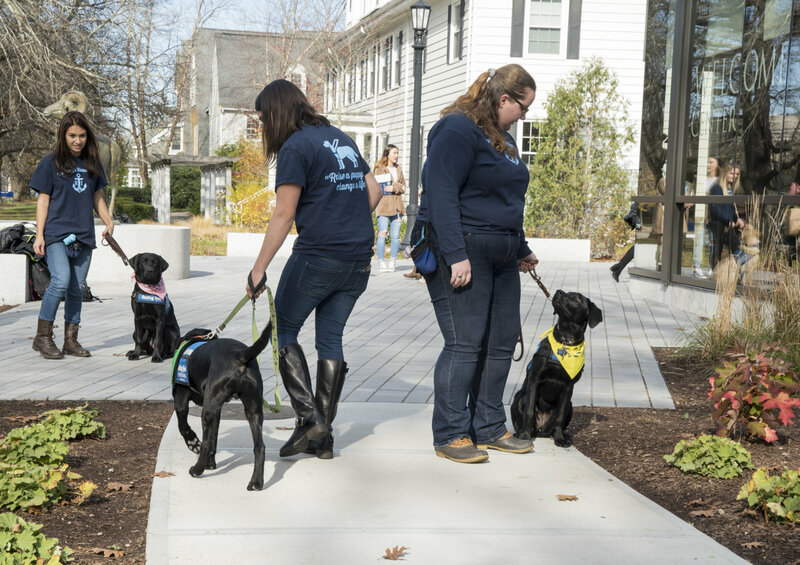 The students socialize the puppies and acclimate them in a variety of settings for 16-18 months, when the dogs are returned to Guiding Eyes for six months or more of specialized skills training. Because the club is based at a university, the rules are stricter than those for an individual raising a puppy at home. URI stipulates that the club can raise no more than seven puppies at any time, and all must be Labrador retrievers. URI provides a room in Woodward Hall where the dogs can be crated when the students have an obligation that the puppies can’t attend. The puppy raiser must have the permission of each professor before taking the dog to class, and no dogs are allowed in laboratory settings. To qualify as a puppy raiser, students must live off campus — small dorm rooms are less than ideal for active puppies — maintain at least a 3.0 GPA, complete a free, six-hour certification on campus and be an active club member. Attendance is taken at weekly meetings; members must take part in outings on campus or in public settings with the puppies; help with fundraisers and log several hours as certified dog sitters. Allison Doyle, a junior med-lab sciences major and the club’s primary sitter, was keeping Moses company. He is the youngest of the URI pack. “I was a pretty active sitter my first two years, which really helps you build up to raising,” she says. Gerald Brenninkmeyer, director of Canine Development at Guiding Eyes for the Blind, would agree. 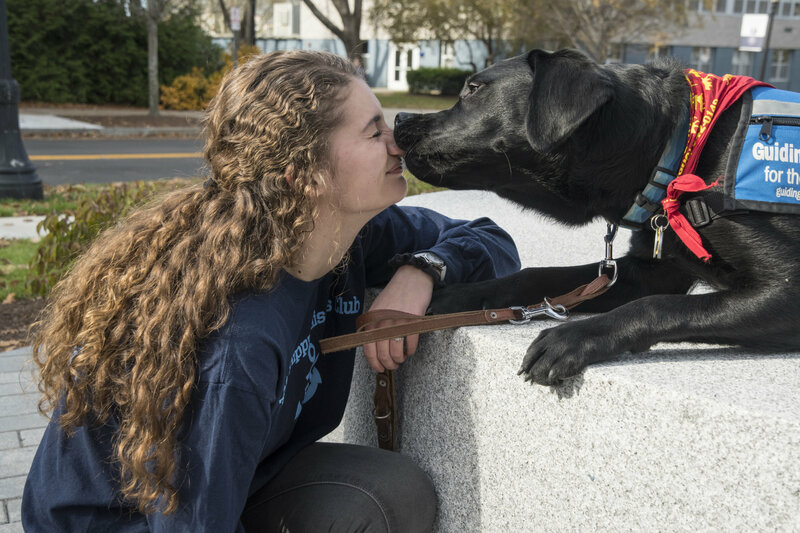 “Guiding Eyes for the Blind’s unique puppy raising clubs on college campuses provide an ideal learning and growing environment, allowing both the student and puppy to gain valuable experiences which will prepare them for their lives ahead,” he says. 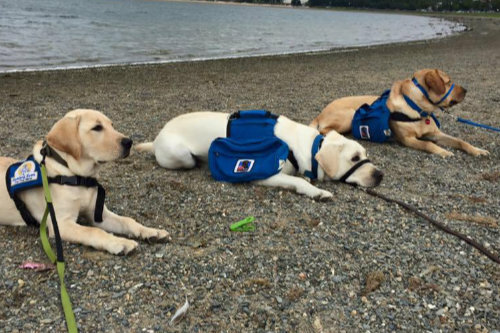 Part of the club’s mission is to educate the public about service dogs. “We raise awareness about the differences between service dogs, therapy dogs, emotional support animals and pets. Service dogs are the only ones protected by the ADA (Americans with Disabilities Act) and are highly trained to perform specific tasks,” Provensal says. Dogs in training have the same rights as certified guide dogs. They can attend class, go into stores and ride public transportation. These rights, and their intensive training and responsibilities, set them apart. This major in the College of Environment and Life Sciences is designed for students interested in applied animal science careers. 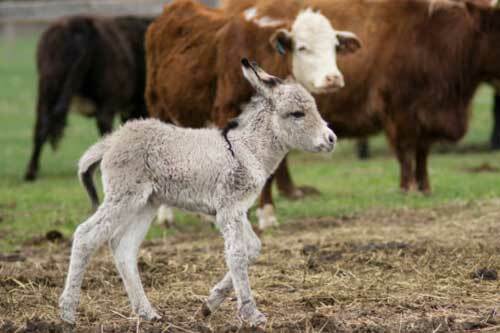 Program tracks are Animal Management, Animal Science, and Pre-Veterinary. Provensal has seen a change in awareness on campus since she began raising puppies. Initially, she would be walking her pup, and people would distract the dog or want to pet him. Now, she hears people whisper “that’s a dog in training” or just smile and say nothing. “That makes me so happy,” she says. At the end of 18 months, Guiding Eyes evaluates the dog, and if the dog does well, he/she progresses to the first of four stages of harness training with professional training staff. Because the training is so intense, a dog can be released at any time and be evaluated for a different career, say as an explosives-sniffing dog. That happened with Provensal’s first pup. If the dog is not fit for another profession and is a better fit as a pet, he/she is adopted out to a family. The waiting list for these proven pups is long, Provensal notes. 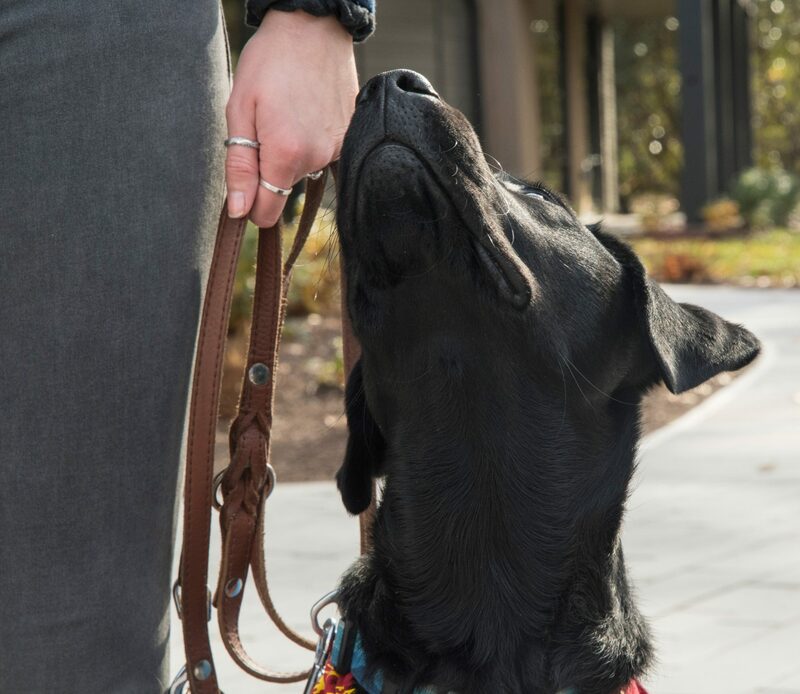 Guiding Eyes keeps puppy raisers updated on their dog’s progress, invites them to the dog’s graduation and gives the eventual owner the option to keep in touch with the students. Still, giving up the dogs they have loved and labored over is difficult, Provensal admits. “Honestly, it’s really painful. I cried for weeks the first time. Once I heard how he was doing and knew he was happy, it made me happy. It’s very rewarding and so fulfilling to see them doing what they are meant to do,” says Provensal, who remains committed to puppy raising. She hopes to explore related career options after she graduates next year.